One of my most popular uses of the iPhone is as an alarm clock. The built in alarm clock is very basic, it does what's it's supposed to do, not much more. 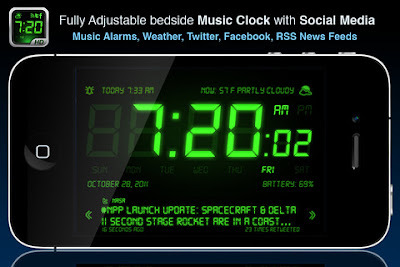 Alarm Clock HD is an alarm clock on steroids. 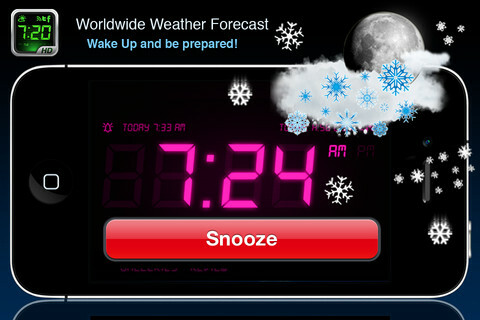 Aside from the basics, Alarm Clock HD gives you local weather information and it integrates with your different accounts to give you personalized information. You can login with your Google Reader account to get headlines from RSS feeds that you subscribe to and it integrates with your Twitter and Facebook accounts. Some additional things that Alarm Clock HD offers are a flashlight by shaking the phone (could be useful at night), a sleep timer that lets you play gentle music as you fall asleep, and you can wake up to the sounds of music you have on your iPod. Alarm Clock HD has a bunch of different things you can customize, like the color of the clock, change the brightness, how long the snooze will be, and you can customize what information you want to appear on screen. Another cool feature is that you can receive alarms even when application is closed using local iOS push notifications, so you can close the app to save battery life and it will still wake you up. Alarm Clock HD is a universal application so you can use it on both your iPhone and your iPad. 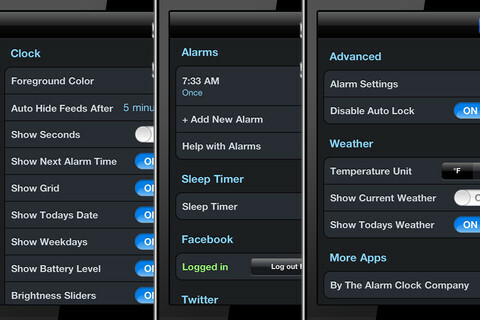 The paid version costs $0.99 and offers unlimited alarms and no ads, you can also get the free version.